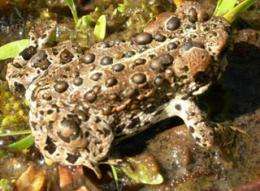 (PhysOrg.com) -- Livestock grazing is apparently not the culprit in the steep decline of Yosemite toads and their habitat, according to the results of an extensive, five-year study conducted by UC Davis, UC Berkeley and the U.S. Forest Service. A direct correlation between the intensity of cattle use and toad occupancy of meadows was not found for any portion of the grazing season  early, mid or late, said Leslie Roche, a UC Davis Department of Plant Sciences graduate student who worked on the study. Results from the study will impact ranchers whose grazing allotments were restricted by the U.S. Forest Service in 2001 based on the assumption that grazing is contributing to the toads decline. Forest Service officials will use the study to develop plans that allow grazing within appropriate standards while conserving toads. The researchers had hypothesized that a reduction in grazing intensity would stop or even reverse the decline of the Yosemite toad but, in fact, they found no evidence to support that premise. Results strongly indicate that toad presence is driven by meadow wetness rather than cattle utilization, said Roche, who is completing her doctoral dissertation on this project. From 2005 to 2010, the research team conducted experiments on 39 meadows in the Sierra National Forest, analyzing the effects of different management practices including grazing across the entire meadow, fencing to exclude livestock from breeding areas and no grazing within a meadow. They examined the impact of these practices on tadpole density, breeding-pool occupancy, water quality and other elements that support Yosemite toad survival. The Yosemite toad was once one of the most prevalent amphibians in the high Sierra including Yosemite National Park, where it was first discovered and after which it is named. But its population and habitat has declined sharply since the early 1980s, disappearing from much of its historic range  meadows at elevations between 6,500 and 11,500 feet from Alpine to Fresno counties. Other researchers on the study included UC Davis Professor Kenneth Tate, Roches advisor; Professor Barbara Allen-Diaz and doctoral candidate Susan McIlroy, both of UC Berkeleys Department of Environmental Science, Policy and Management; and research wildlife biologist Amy Lind of the U.S. Forest Service Pacific Southwest Research Station. Their complete report is available online at: rangelandwatersheds.ucdavis.edu/main/projects.htm under the section titled Cattle Grazing, Mountain Meadows, and Sensitive Species.